This is a picture of George Washington Polk and Rella Sanchez. 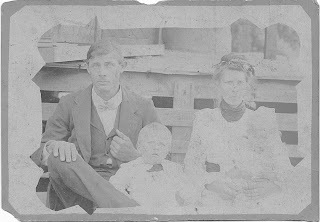 These are my great-grandparents. Rella is the 4th child of Alexander Sanchez Jr. and Julia Sheffield. She was buried in Springhead Cemetary in Polk County, Florida. Rella and George had 9 children and lived in the Plant City area. She looks a lot like her mother Julia Sheffield in the picture. If you look real close you will see that Rella is holding a baby in her arms. I didn't see this at first, but believe from what I have heard from others that this baby is Allie (Polk) Weeks and the little boy is George "Clayton" Polk.